Haven’t decided on a hotel yet? You can look at other available hotels in the Languedoc-Roussillon region with Booking.com. If you are interested in staying in a villa in Languedoc-Roussillon, Booking.com offers a number of stunning properties. Two distinct provinces considered as an administrative whole, Languedoc and Roussillon offers a richly layered history, unspoiled countryside, and plenty of spirit. Languedoc is where ancient troubadours sang of gallantry and love in the Occitan language, or langue d’oc, a language quite distinct from today’s modern French. Pull yourself away from the attractions of the coastline and explore castle ruins perched high on rocky outcrops, wild mountainous regions favored by hermits and heretics, and vineyards stretching as far as the eye can see. 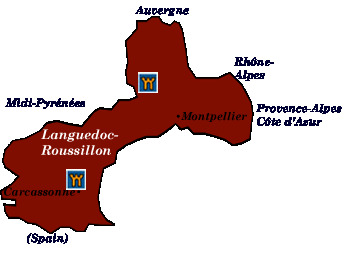 Roussillon identifies with the culture of Catalonia. Until the treaty of the Pyrenees demarcated the border between Spain and France in 1659, the area extended into the present-day autonomous region of northeastern Spain. Carcassonne Busloads of daytrippers aside, Carcassonne—a UNESCO World Heritage Site—is one of Europe’s most splendid walled cities and a worthy stop on any itinerary in southern France. Two walls—1.7 km and 1.3 km long—enclose a “modern” medieval town. 52 stone towers, dry moats, and a drawbridge are remnants of centuries of siege warfare. Carcassonne was once a former stronghold of the Cathars—a religious sect exterminated as heretics in the 13th century. Other famous Cathar fortresses may be visited as well. Dramatically situated, the castles of Quéribus and Peyrepertuse (car only) are excellent insights into the region’s turbulent past. Roman ruins The city of Nîmes is home to a wonderfully preserved Roman amphitheater, Les Arènes, which in present times hosts bullfights and concerts. The Maison Carrée is a small, 2000-year-old temple considered one of the best preserved in the world with fluted Corinthian columns and a sculptured frieze. Just outside of Nîmes, the Roman Pont du Gard, a grand multi-tiered aqueduct and bridge, remains one of the wonders of the classical world and is now a UNESCO World Heritage Site. Aigues-Mortes and the Petite Camargue The walled town of Aigues-Mortes was founded by Louis IX as a Mediterranean port, but failed due to the silt of the Rhône, which pushed the sea to the south. Ignored over time, the town remains in its medieval glory. Just east, the Petite Camargue is an expanse of salt water lagoons and marshland home to 400 species of waterfowl, including flamingos, egrets, and herons. Côte Vermeille Just before the Spanish border, the Pyrenees reach the sea, creating a series of small rocky coves and tiny ports. Collioure, one of the most picturesque with its pastel houses and anchovy fishing boats, inspired artists such as Henri Matisse and André Dérain. Forming part of the harbor wall, the Château Royal was built by the Knights Templar in the 13th century and is now a museum.